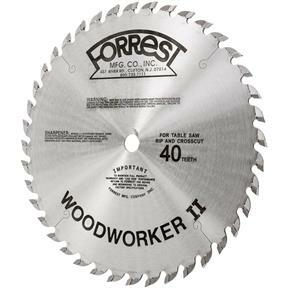 With this all purpose blade for table saws you can rip and crosscut 1" 2" rockhards and softwoods resulting in a smooth as sanded surface. With 20° face hook, ply veneers will crosscut with no bottom splinter at moderate feed rates. Double hard and 40% stronger C4 carbide will give up to 300% longer life between sharpenings. Ends blade changing (one blade does rip, combo and crosscut), second-step finishing and cutting 1/16" oversize to allow for resurfacing. Buy and sharpen one blade instead of 3 (24T rip, 50T combination and 80T crosscut).